I first wrote about John Bruce around 30 years ago when Bruce’s of Airdrie was in its early years. In July of last year John invited me to visit him in Scotland to talk about the company. 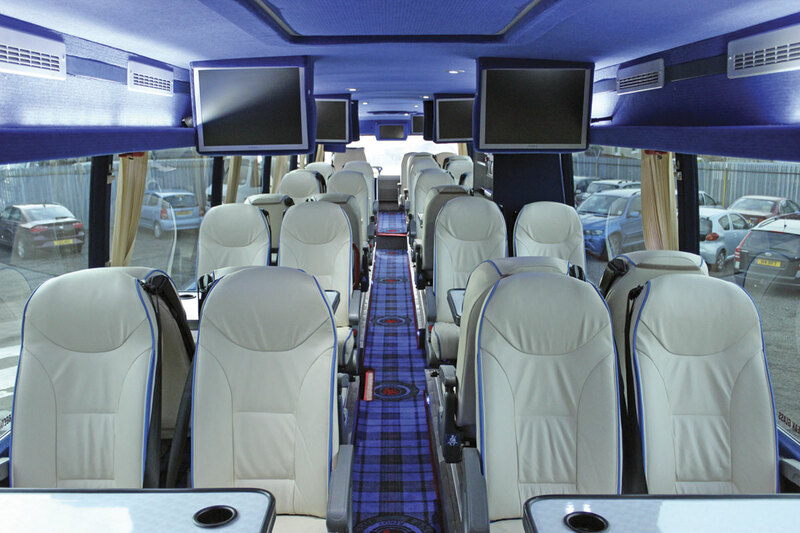 It specialises in high mileage contract work and had just invested £400,000 in a new Van Hool TX17 Astron to serve as the Rangers team coach and assess the scope for a top-end corporate work in the area. I spent a day in Salsburgh, returned south and was sitting down to write up the story a few days later when I got a call saying that the garage, the new coach and three others had been completely destroyed in a fire. Nobody has ever been charged in relation to the blaze, but holes cut in the fence and rear of the building are evidence that it wasn’t accidental. 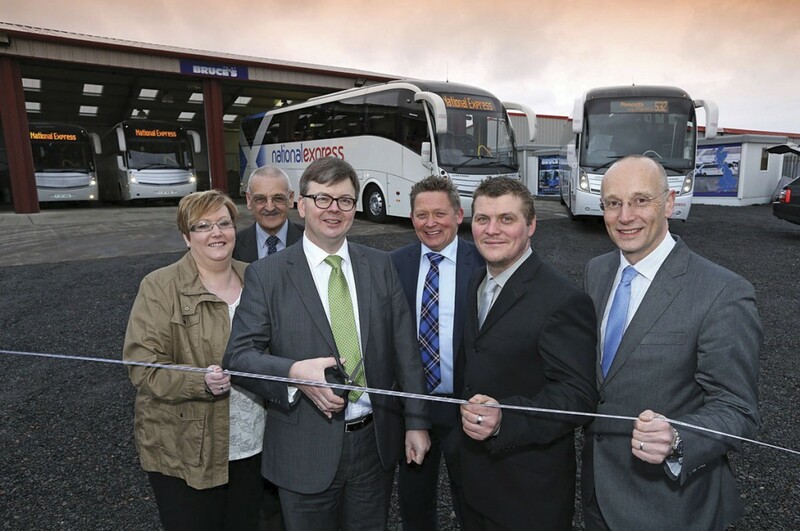 Last month I returned to Salsburgh where a new garage has been built on the site of the old one and another team coach has replaced the lost super executive. 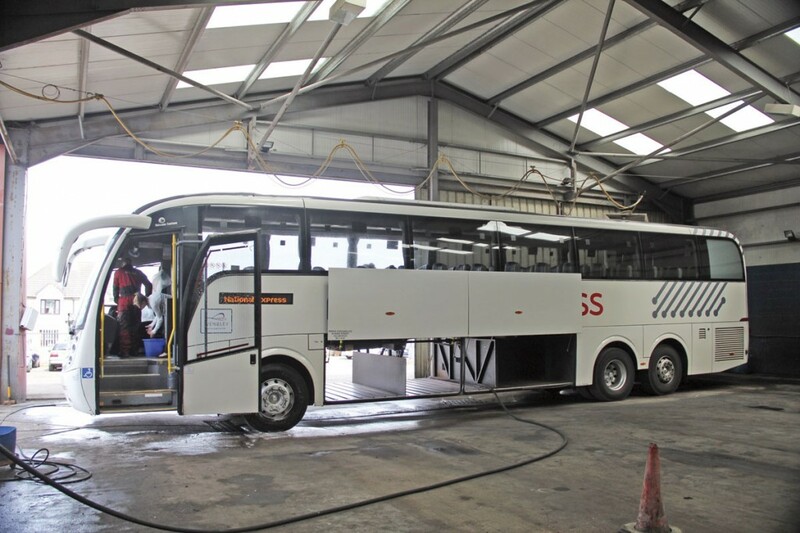 A new fleet of tri-axle Scania Caetano Levantes has superseded the coaches used previously on National Express work, as planned before the conflagration. He began in coach operation in his own right in August 1982 but already had a lot of experience having served his time as a coachbuilder with Walter Alexander at Falkirk and had operational experience with Eastern Scottish and Park of Hamilton. ‘Parks was an amazing grounding in the industry for starting up my own company,’ he recalls. He had also briefly tried truck operation in 1980, but ‘it didn’t work out.’ His next venture was to start his own coachbuilding operation and it was this that led to the move into running coaches. When he repaired a Ford R1114 insurance right off for Irvines of Law they gave him a 53-seat Bedford VAL Plaxton Elite in payment. Scott MacPhail gave him a school run to use it on and Bruce’s of Airdrie was in business, growing to take on other schools as well as competing for private hire work. The first steps in the direction of the express work in which he was to become a specialist came in 1988. 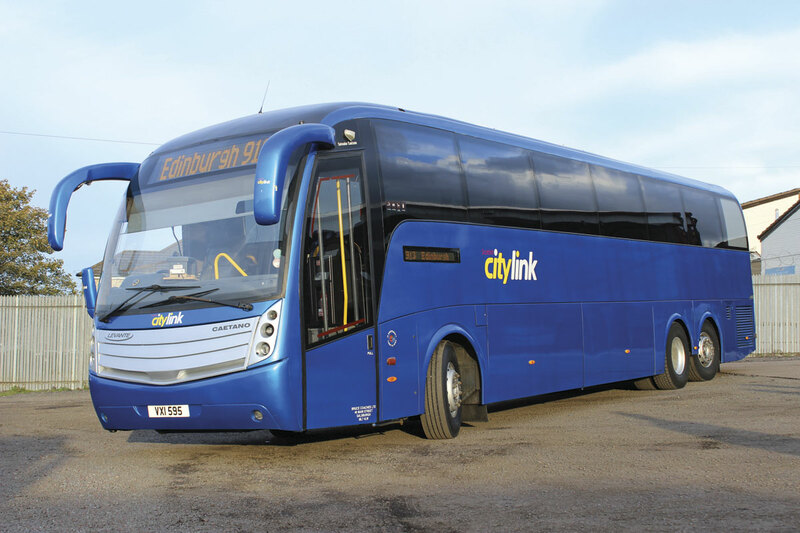 The Scottish Bus Group had started Scottish Citylink with vehicles supplied by its constituent companies. When they went on strike it turned to independents and for around a month Bruce’s coaches crossed the picket lines to help them, only to be dropped as soon as the strike ended. 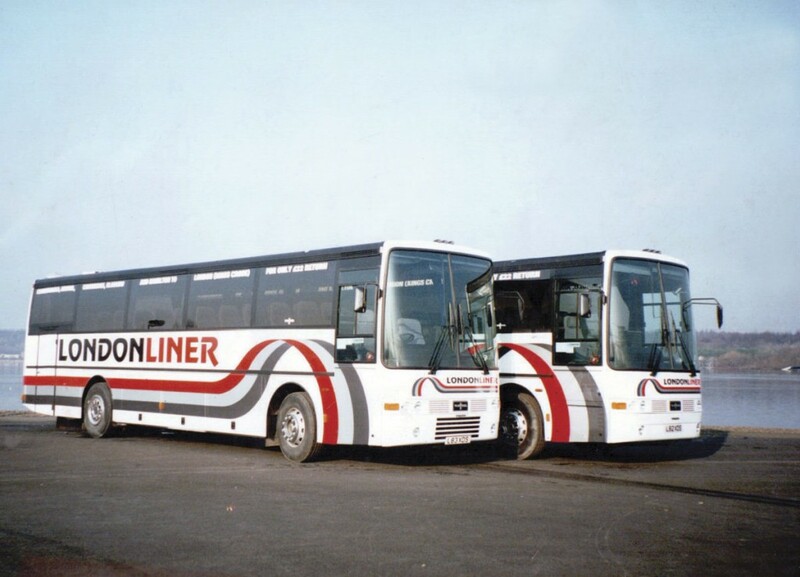 With coaches coming back of tour and drivers available to drive them John decided to start his own express service, LondonLiner, using two Volvo B10M Van Hools that ran day and night covering 500,000km a year. ‘Our service had an impact on the London market,’ said John. ‘For the first four months we charged £12 return and then £18 when I think Citylink were charging £32. We gave a concession for OAPs, UB40 holders and nurses. Then in 1989 he came to an agreement with Scottish Citylink and started running for them using the LondonLiner name. Then in 1991, for what he describes as ‘family reasons’ he sold the yard at Glenmavis along with 18 of his 21 coaches to Citylink, only keeping three that were contracted to David Urquhart. By December 1993 he was running LondonLiner again on Citylink’s behalf, an arrangement that lasted until 1997 when Citylink had to dispose of its cross border services having taken on the Scotrail contract. 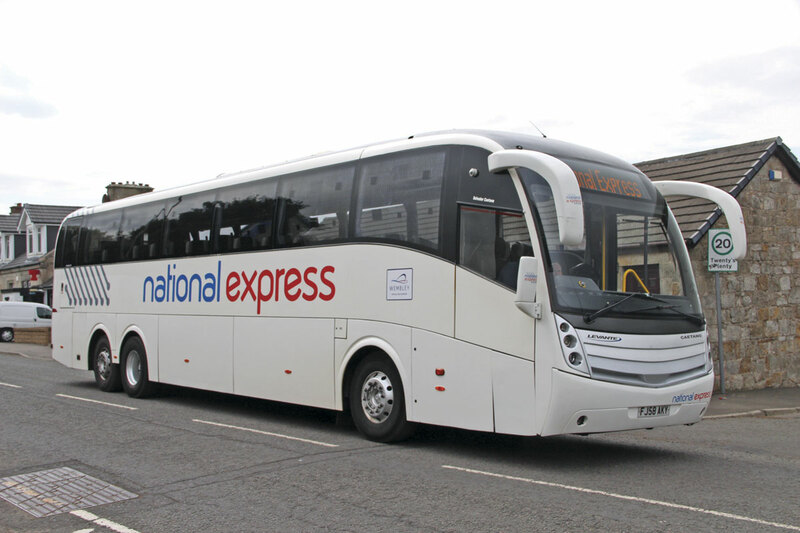 A new tie-up with National Express began with half of the Bournemouth to Edinburgh 539 service taken on, with Excelsior covering the other half until Bruce’s took it over completely. At this stage, considerable duplication work was being undertaken for both Citylink and National Express. Bova Futura FHDs with 12.9-litre DAF engines were used, which were relatively unusual though not unique on the work. Further Futuras were bought in 2000, 2001, 2002 and 2004. 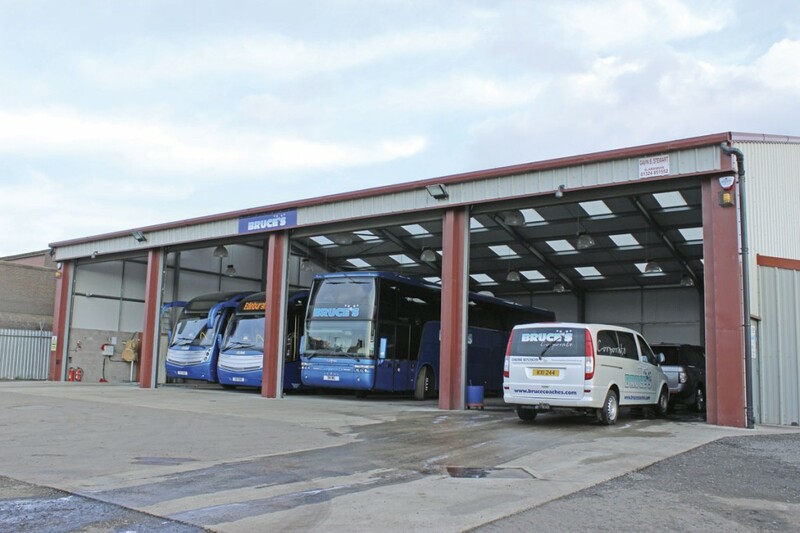 With the growth of National Express responsibilities and ongoing duplication work for Scottish Citylink the business gradually cam to concentrate its focus on express operation, although private hire was still undertaken. Another home grown venture was the 1999 launch of ‘Motivator’ an express service between Glasgow and Edinburgh run in conjunction with Longs Coaches. The company’s ambitions for the service were frustrated by the inability to get permission to operate from the front stands at Glasgow’s Buchanan Street Bus Station, despite determined efforts to do so, yet within a month of selling out to Stagecoach, they had managed to obtain them. 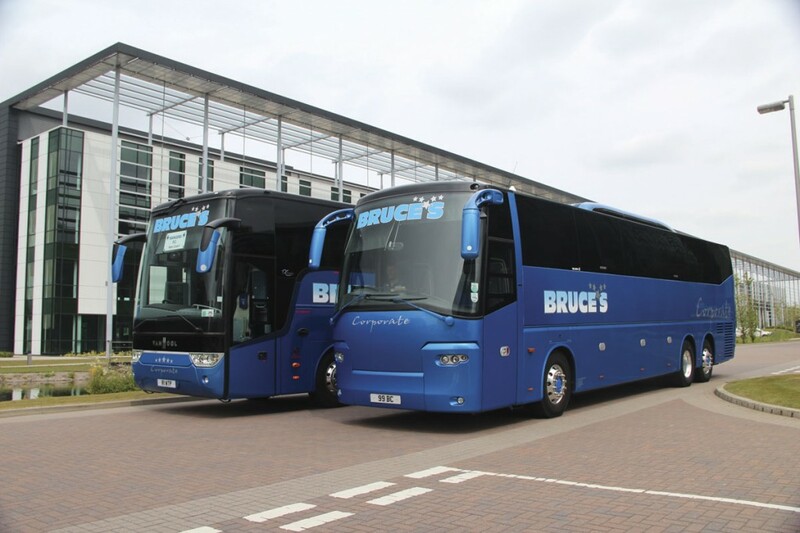 The National Express routes Bruce’s operate today are the five longest on the network, indeed the highest distance services within the UK of any operator, covering vast annual mileages. Loadings on all of them are such that tri-axle coaches are required. The 336 links Edinburgh and Plymouth which involves Bruce’s covering 624 miles (the actual route is 585 miles), John told me. When Bruce’s started running it in 2009 it used to go all the way to Penzance which was officially 678 miles (excluding positioning) but it was cut back in 2010. ‘It used to seem weird seeing a coach going through Salsburgh with Penzance on the destination,’ said John. The 336 sets off from Edinburgh at 21.30 and arrives in Plymouth the following day at 12.40. The 532 Plymouth-Edinburgh takes a slightly different route in the other direction leaving Plymouth at 05.30 and arriving in Edinburgh at 19.30. The UK’s second longest route is the 588 between London and Inverness which is 593 miles. 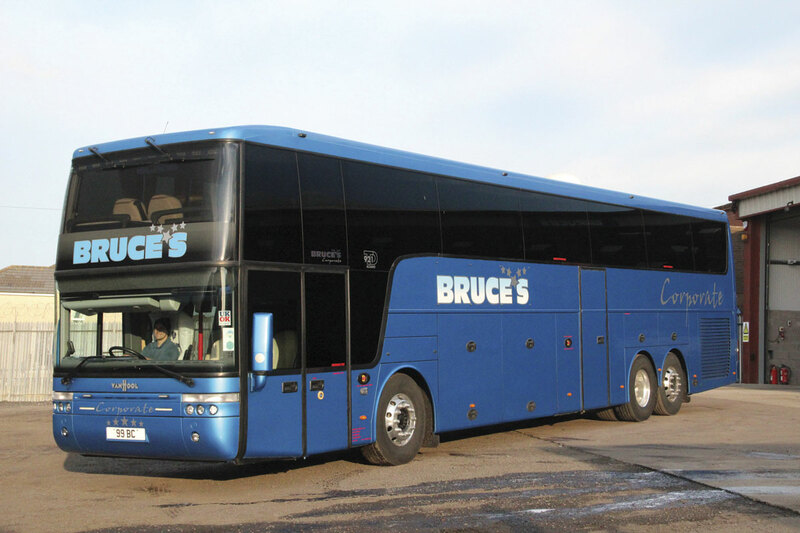 Bruce’s also operate the 539 between Edinburgh and Bournemouth on which their coaches clock up 567 miles and the 590 between Aberdeen and London representing a 557 mile trip. With short turn round times between runs, the nine Scanias used on the routes rack up immense mileages. ‘The PVR requirement is 8.4 of the nine Scanias’, John claimed. They cover around 14,000km between fortnightly full services. Before every departure from the depot each coach gets a pre-departure check which includes everything on a mechanical checklist. In addition there is a 12 point interior checklist and a 17 point exterior check list that is gone through. National Express work currently represents around 85% of the company’s workload but Bruce’s also maintains healthy relationship with Scottish Citylink and megabus.com. Three coaches were involved on Citylink diagrams throughout the summer period and John was awaiting news on work that would keep them occupied on an ongoing basis. Were he unable to obtain work for the other members of the fleet there is always the option of starting a new service in the company’s own right, something that would hold no fears given the vast experience in the field and the depot location. However, he stresses that this is not his preferred option. Megabus.com work tends to be more sporadic though it can come in large chunks. 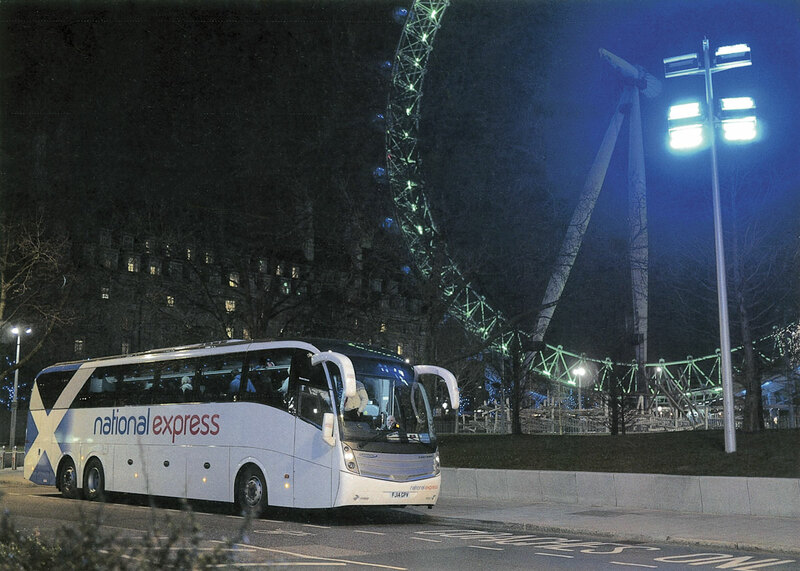 The Bova Magiq once did London services on 42 consecutive days. Looking after the operation John has a strong team. In charge of the workshops and taking an ever increasing role in the running of the business is his eldest son, John. Working alongside him in the workshops are Rab Deacons and Andy Watterson. In the office, the Operations Manager is Guy Gray, Audrey Watson is the Office Manager and Esther Beuken is the Transport PA. 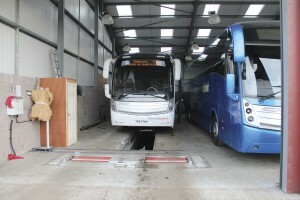 Ensuring the coaches get properly cleaned inside is a team of four ladies. On my latest visit we talked about the fire, which began around 2am on the morning of Sunday 21 July. Martin MacPhail of MacPhail’s Coaches, based next door, came in off a hire at 12.10 and all was well. Later his brother spotted there was a fire and Martin rang Guy who rang John Junior while Martin rang John. Guy arrived first with the two Johns just behind him and initially already the flames were coming through the roof. ‘You couldn’t get near it,’ John said. They had some difficulty convincing the fire brigade to allow them to move the coaches remaining in the yard, but with the prospect of them catching alight and the fire spreading to MacPhails and beyond to an old folk’s home they relented and two Levantes and a Vito van were rescued. The garage building was entirely burned out. Nothing within it survived and John points to a buckled wheel as the only thing that is even recognisable. 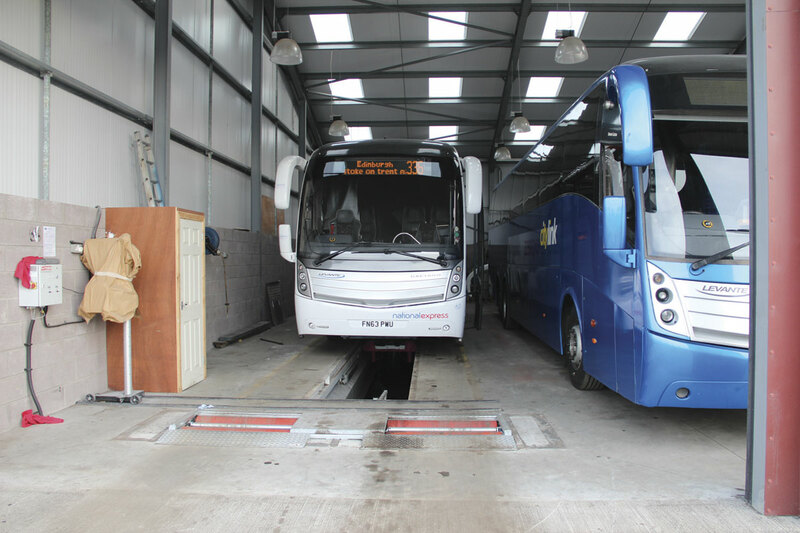 The losses included the Van Hool executive, then only three weeks old, a super executive Bova Magiq used to support it, two 57-plate tri-axle Scania Caetano Levantes used on National Express work, all of the garage equipment and tools and two motorcycles. The offices, a portable building, were separate from the main garage and though parts of the exterior melted, the paperwork all survived. John continued, ‘It was 6.30 at night before we were allowed in – it was a horrible time.’ The keys for the driver’s cars were all in the offices and those returning after driving to Plymouth weren’t allowed in to get them until that time. ‘We were grossly underinsured on the buildings by £100,000 or so. You don’t realise. We’d bought equipment including a set of lifts. The problem going forward is getting insurance having had a fire. The premium has increased by around 70%,’ he said. John has never been one to sit still and within a week the site was cleared. Fortunately the concrete base on which the depot was based remained intact and the operation was able to run off it. A metal Premier Pit remained usable, though somewhat exposed. By December, the business was operational in a new garage building complete with a 16m long Premier Pit, rolling road and beam setter, representing a £350,000 investment. ‘We changed the layout so that instead of the gable pointing down the yard we turned it about. It is slightly longer than the previous building and we can get seven coaches in, side by side. There’s a small separate building with a 40,000 gallon diesel tank and a store. We’ve also got a Karcher walk round bus wash,’ said John. With the new garage operational John went to see a new mobile office to provide driver’s rest room accommodation. Instead he found a rather smarter portable building that he acquired and turned into the offices, converting the existing offices for the drivers to use. ‘Maybe other operators could learn and check that their insurance is up to date and they’re adequately covered. It’s not the vehicles that were the problem, our broker does that every year, it’s the premises. Make sure you don’t get into the same position that we unfortunately were,’ said John. If coping with the new building wasn’t enough, in mid-November the first of nine new tri-axle 14.2m Scania Caetano Levantes John had told me about on my first visit arrived. John had been running 58-plate Scania Caetanos but these were due for replacement. Scania had loaned him a demonstrator for six months with a 430hp Euro5 engine rather than the original 340hp unit, the 12-speed, two-pedal Opticruise automated manual transmission and a lower ratio rear differential specification that runs at only 1,100rpm (rather than 1,750rpm) at 62mph/100kph on the limiter. The result is a quieter coach and better fuel consumption. Testing the demonstrator convinced him to go for this option and it has proved a good decision as they are returning what he considers excellent figures, averaging 10.1mpg. Although the bodies are ostensibly the same, they have 57 recliners and a rear saloon toilet rather than the 61 seats of their predecessors. The current National Express rules on vehicle acquisitions are that their contractors have to use Caetano Levante coachwork that can be mounted on Volvo, Scania or Mercedes-Benz chassis, though this was not the case when John placed his order. ‘We could have ordered anything we wanted, but we wanted the Caetano. I think they are as good as a Van Hool. We don’t have any issues with them. The Scania Caetano Levante combination is perfect one for our operation,’ he said. One aspect of express operations is having to comply with DDA requirements. John doesn’t see it as a big issue. ‘There is only the odd hydraulic pipe problem with the lifts,’ he said. ‘The new style PLS lifts are much better. They are more mechanical, quieter and lighter. He finds that now that the whole network is accessible, using coaches has become more popular with wheelchair passengers because they can turn up and know that they will be able to make a connection. Of the nine Scania Levantes the new coaches were purchased to replace, two were lost in the fire, one was sold to Scania, another went to Ace Travel, and three have been refurbished and were used during the summer on Citylink on services between Edinburgh and Oban and Edinburgh and Fort William with the third operating duplicates. 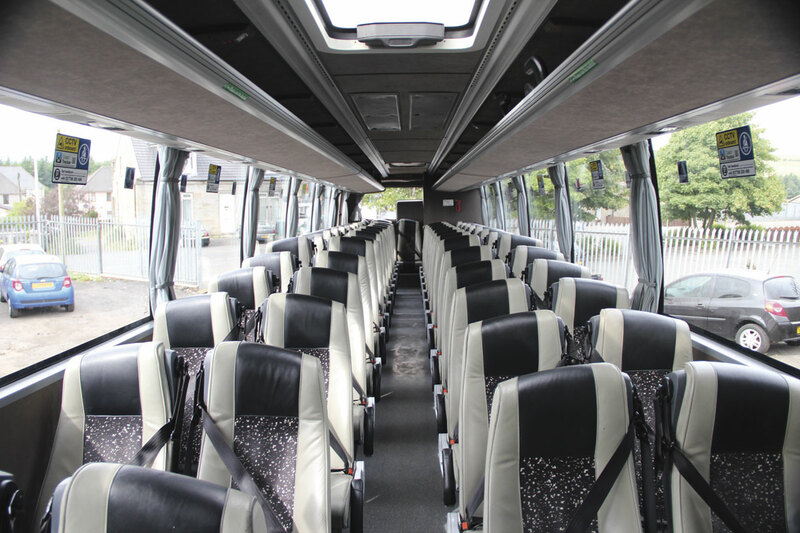 The other two have been refurbished by Eastgate as 59/61 seaters and are currently up for sale along with a 2004 49-seat Bova that has also been refurbished. 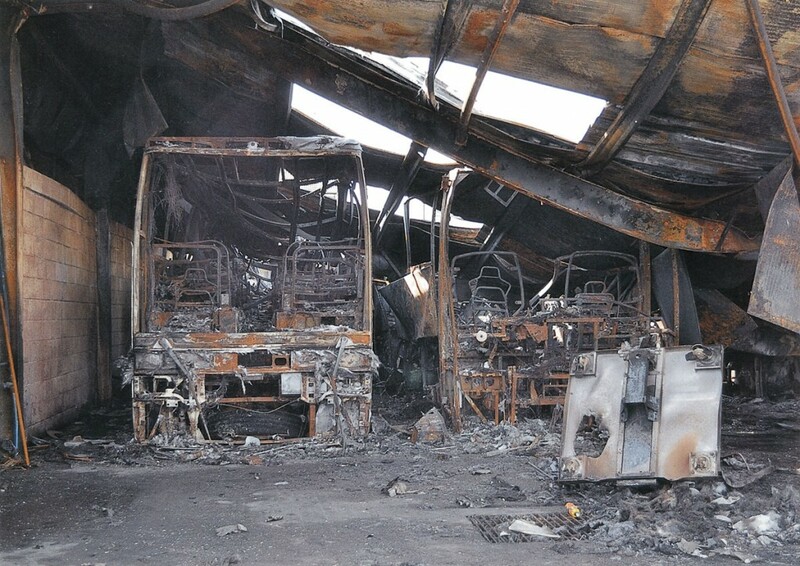 The Van Hool TX17 Astron lost in the fire was a lavishly equipped coach built exactly to John’s requirements. It had 41 white leather trimmed seats, a centre kitchen, a glass roof centre section and a twinkling effect to the remaining ceiling sections, a rear lounge area, Sky television, wi-fi, chargers, four fridges, 12 televisions, a driver’s bunk, a centre toilet, a table that converted to a bed and a Webasto pre-heater. Seat trim was all in white leather with names embroidered in blue and the carpets were a special blue tartan design for Rangers FC. John had hoped to work with Rangers to develop a mutually beneficial role for the coach for the future. He admitted at the time of its purchase that he didn’t know whether the money was there to be made to justify the purchase but said, ‘I’m going to find out.’ His comment, ‘If I don’t buy it now when am I going to?’, suggests the acquisition was as much something he wanted to try as something he was sure would pay off, though he also said, ‘some people are besotted with money. I’m not, though obviously things have got to stack up’. 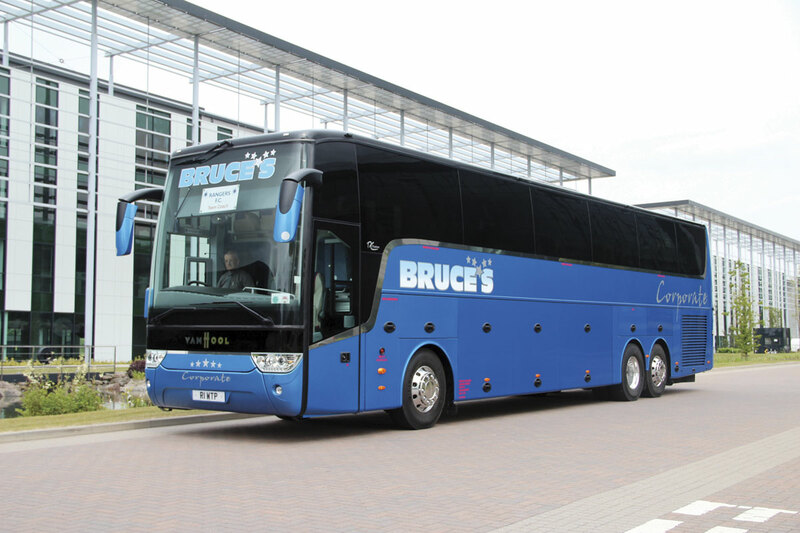 The Van Hool was supplied by Moseley Distributors, whose Glenmavis premises are located on a site from which Bruce’s once operated. Its replacement is the previously mentioned TD921 Altano which is ideal for the role, even though it lacks some of the arguably less essential features such as the glazed roof. 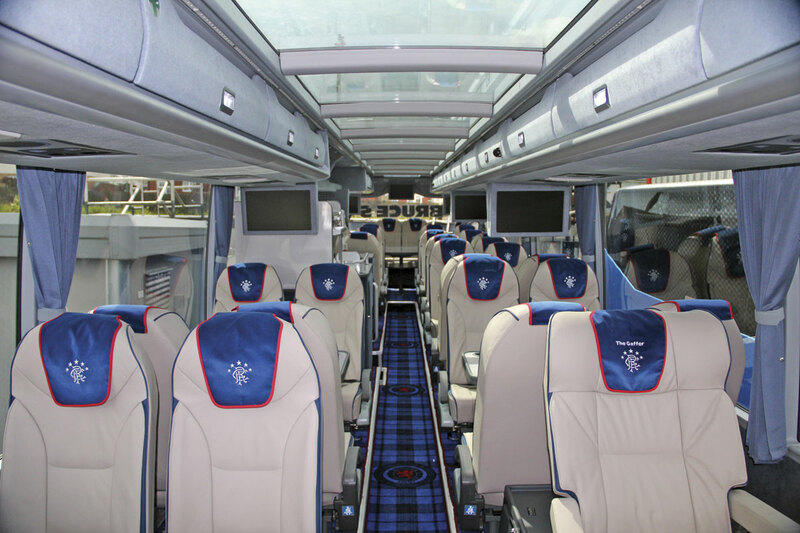 As well as the replacement Rangers team coach, there is a second coach to super executive team coach specification which replaced the Bova Magiq used as back up coach before it too was lost in the fire. This is one of the Scania Levantes which has been converted to accommodate 48 seats, eight tables, charging points at all tables, wi-fi, a servery with ovens, fridges, microwave and hot water and Sky television. It also carries the blue livery. ‘For the future, the plan is for me to take less and less part in the daily running of the business and for my son to be more and more involved in day to day running, building on the excellent relationships we have with National Express and Scottish Citylink. He’s already involved in everything and he needs to drive it to the next stage’, said John. As John senior intends to reduce his role, I spoke to John junior about his background and plans for the future. He explained that he had started work with his father when he was 16, left after two years to join Agreco Engineering and then at 21 bought a pub, The Railway Tavern at Caldercruix, and though it did all right it was not a massive return for a lot of hard work. Putting the 14 months spent there down to experience, he went back to working for his father and got his PSV. ‘I was always going to do buses anyway’ he said. Scott, another of John’s sons, who is now in his early thirties, bought Coatbridge based United Coaches a couple of years ago and runs six coaches.